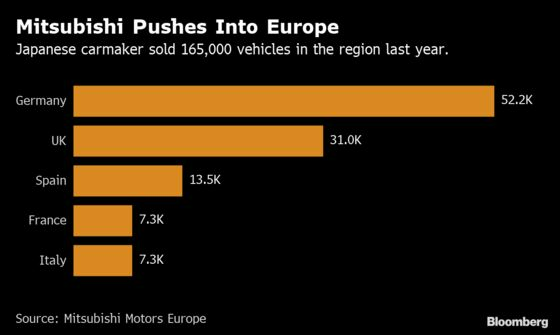 (Bloomberg) -- Mitsubishi Motors Corp., the smallest member of the embattled three-way alliance with Nissan Motor Co. and Renault SA, is counting on an imported hybrid SUV to increase car sales in Europe as the partnership seeks to get past the departure of former head Carlos Ghosn. The Japanese automaker views the region’s new rules on emissions as an opening to develop its electric vehicle business, according to regional head Bernard Loire, pointing to its plug-in hybrid Outlander SUV model as the most promising. Demand for the model this year, especially in France and Italy, could help propel sales growth at Mitsubishi’s European unit by 6 percent, outstripping a forecast “at best” of zero expansion of the overall market, he said. The Franco-Japanese alliance, which is the biggest car-making partnership in the world churning out more than 10 million vehicles a year, has been going through a crisis following Ghosn’s arrest in November for financial crimes. Amid internal probes into finances and governance, the three manufacturers are trying to put their strategies for cooperation back on track after unveiling a new organization last week. The new governance structure gives Mitsubishi a seat on the board that oversees their alliance. Mitsubishi granted its Amsterdam-based unit more freedom to manage European operations, Loire said. The company increased regional sales last year by 19 percent to 165,000 vehicles, about 13 percent of the total worldwide. That’s a far cry from Renault’s European sales of close to 2 million units and the 3 million achieved by Peugeot-maker PSA Group. Mitsubishi’s cars destined for Europe are made in Japan or Thailand, with no plan to start production locally, Loire said. By contrast, Renault and Nissan have more integrated operations in Europe including joint output. The French automaker builds the Nissan Micra model at one of its factories near Paris as well as manufacturing engines for its partner.